From 25-26 April, Med-Tech Innovation Expo returns to the Ricoh Arena in Coventry to showcase the very best of the UK & Ireland’s medical technology sector. Med-Tech Innovation News reporter Reece Armstrong takes a look at what's on offer at this year's exciting show. This year’s expo will host its most diverse range of exhibitors to date. With a host of exciting features, insightful speakers and not to mention all of the latest disruptive tech on offer, Med-Tech Innovation Expo is poised to bring together the medical engineering and manufacturing community across two action-packed days. Med-Tech Innovation Expo will bring together a world-class speaker line-up across its two stages. In advance of the event, Med-Tech Innovation News editor Dave Gray sat down with a handful of speakers from both stages to discuss the challenges of working in the sector, plus the many opportunities. This year, the conference looks into the future and will examine the ways in which technology and social media are expected to influence healthcare and life sciences in the years to come. Karen Taylor, research director at the Centre for Health Solutions, Deloitte UK, is kicking off the conference by predicting what the healthcare and life sciences sectors will look like in 2022. Also speaking about where technology is taking healthcare is Debbie Chinn, director of solutions assurance at NHS Digital, who will discuss the current and future trends of clinical risk management for health informatics. Later in the day, Dr Chris Subbe, consultant physician and senior clinical lecturer will examine the lessons we can learn from social media when it comes to making hospitals safe. For Subbe, innovation in healthcare is increasingly a consumer concern: “Integration of medical technology with consumer technology is the area where I see the greatest scope for immediate innovation. “It is not by accident that Apple is increasingly active in this field. Knowledge about what ‘normal’ and ‘well’ looks like for individual patients is crucial to understand what ‘unwell’ and ‘at risk’ looks like. And in patients with chronic illnesses this can only be delivered by collected data while patients don’t feel as ‘patients’,” said Subbe. Rounding out the day will be a talk on patient safety and quality of care from Janet Monkman, CEO at the Academy for Healthcare Sciences. Monkman will give a talk on the Life Sciences Industry Credentialing Register - the implications for any company accessing any NHS site, and how the register can benefit patient care and advance the healthcare science workforce. The UK’s medtech sector faces considerable challenges on home turf. This is especially true in terms of access to the NHS. In recent years the government has started responding to these concerns. Alan Sumner head of public affairs, healthcare development and strategic services at Roche Diagnostics will open day two with a look at the government’s Accelerated Access Review. Liz Ashall-Payne is the founder and CEO of ORCHA – an organisation which reviews apps in the healthcare space. At the Med-Tech Innovation Conference, she will discuss the mHealth landscape; one in which regulation continues to evolve. “Those of us who are concerned with proactively managing our health are increasingly turning to mobile (or ‘mHealth’), and the use of unregulated apps”, explained Ashall-Payne. Visitors can also attend a number of inspiring stories of success from family-run businesses including, Forte Medical and Salts Healthcare. Giovanna Forte, chief executive, Forte Medical and Philip Salt, chief executive, Salts Healthcare will be sharing their experiences of transforming a family business into a global success. Dr Ian Campbell, director of health and life sciences, Innovate UK, will provide an update on industrial strategy and the industrial strategy challenge fund, while John Wilkinson, director of devices, Medicines and Healthcare Products Regulatory Agency will be discussing the new Medical Device Regulation – and the actions companies need to be taking. Continuing with the futuristic theme, Joel Haspel, partner, GE Healthcare Finnamore will be giving a talk on partnering for artificial intelligence development and delivery. Unsurprisingly, innovation will be a key theme at this year’s conference. Professor Mike Hannay, chair, National Network of Academic Health and Science Networks (AHSNs), will talk about the adoption and spread of Innovation in the NHS, and the role of AHSNs in addressing some of the biggest health challenges facing the UK. Mirren Mandalia, senior director, new ventures & transactions (medical devices), Johnson & Johnson Innovation, will share his experience of advising healthcare startups and leading investments that J&J Innovation makes in exciting early-stage medical devices. Major changes are on the horizon with the implementation of the new European Medical Device Regulations (MDR), and as such regulation will be at the forefront of discussion for medtech OEMs at this year’s expo. Alan Johnson, technical director at product design group Tactiq, is set to talk about the design challenges of wearable devices on the HealthTech Stage. “An immediate impact will be on devices for which the classification changes. This will particularly impact IVDs (in-vitro diagnostics) and software-only medical devices. Work will be needed to bring existing devices into compliance and some devices may be withdrawn”, said Johnson. Medical device manufacturers have a wealth of opportunity in the years to come. Industry 4.0 holds masses of potential, particularly where compliance and quality control are concerned. But the manufacturing supply chain is changing shape in other ways, too. Jim Reed, vice president, business development and marketing at Minnetronix will be discussing virtual development partnerships across the medtech supply chain. He believes that sourcing partners from around the globe for specialist manufacturing requirements is increasingly important for British firms to stay competitive. “The industry has evolved to the point where highly specialised companies exist for nearly all kinds of manufacturing processes or technologies, component expertise, or development domain. In fact, it has become extremely difficult for traditional medical device companies operating as generalist organisations to compete with outside firms in their areas of specialisation, in terms of cost, quality and capability. “Expertise rather than co-location is what matters and virtual organisations leverage the specialised skill set from each firm to improve business objectives. Inevitably, Brexit is set to feature throughout the agenda with uncertainty still present in industry generally. Professor Alexander Seifalian from NanoRegMed will be discussing the development of medical devices using graphene nanomaterials in his presentation on the HealthTech stage. He was happy to talk Brexit though, and has a balanced view on the transition which will directly impact his work. “The negative side is that we have been doing lots of collaboration with SMEs as well as academics throughout the EU, including testing the medical device under GLP (good laboratory practice) in EU countries. This is significantly cheaper for us. The HealthTech Stage will showcase the best and brightest from the Med-Tech Innovation Expo show floor, as well as technical know-how from across the industry, making it a feature not to be missed. Exhibitor Blue Frog Design (stand C8) will be showing off its latest innovation, highlighting how the company used 3D printing to help a patient with an ongoing skin condition. The company worked alongside Medilink East Midlands to help a patient who suffered from paraesthesia – a skin condition in which tingling, tickling, numbness or burning sensations occur with no apparent physical cause. In this case, the patient was experiencing a prickling sensation from the rib cage to the collar bone when his clothes touched his body. Blue Frog Design was able to 3D print a structure that stopped the patient’s clothes from touching his upper body, removing the irritation and improving his quality of life. The company took a scan of the patient to identify the desensitised parts of his body on which the device could be placed. The scan provided Blue Frog the precise data it needed to design the product. Blue Frog was able to produce a device that followed the contours of the patient’s body in a minimally invasive way. The company used medical-grade material to 3D print the device, which is lightweight thanks to its lattice based design. The design also provides ventilation as air can flow through the device, the clothes and the body, helping to keep the patient cool. Blue Frog believes that the product is an example of how useful 3D printing can be for the design and prototyping of medical devices. As a key area of its business, 3D printing allows Blue Frog to produce products which traditional manufacturing processes can’t produce as quickly or economically. Furthermore, 3D printing lets Blue Frog make any required modifications to prototypes during the design process - something which would be technically challenging if using injection moulding, as it would require frequent and costly modifications. Hosted by TV’s Dr Phil Hammond, The Medilink UK Healthcare Business Awards and gala is set to bring visitors and exhibitors together on the first evening of the show to celebrate outstanding achievements from across the industry. A new addition to the awards this year is the Editor’s Award for Business in Healthtech, which has been conceived by the editorial team behind news brands Digital Health Age and Med-Tech Innovation. Created to recognise achievements in business, the team will take into account the impact on unmet clinical needs, company growth and scale, as well as market share. The Medilink UK Healthcare Business Awards have attracted sponsors from some of the UK’s leading government, academic and business organisations, including the AHSN Network, HGF and GovGrant. At the time of writing, a limited number of tickets are still available for this prestigious and entertaining evening – head to www.med-techexpo.com to book. A range of companies are returning to Med-Tech Innovation Expo, representing the diversity and breadth of the medtech industry. This year, exhibitors will demonstrate a wealth of products, with many being shown or previewed for the first time. Here’s a brief look at what visitors can expect to see at the show this year. From design support through to legal considerations, the expo will showcase multiple firms offering services for medical device OEMS. For example, product design consultancy, Renfrew Group International (stand B21), is back once again, with its latest products for medical device design and development. The company will be showcasing a number of products it has helped create across many fields, including prototypes of an artificial pancreas and a home dialysis system developed by medical device company Lucenxia. Covering the product liability market is IHN Insurance Brokers (stand C8), which is on hand to discuss its knowledge of the technology sector, as well as its risk management and tailored insurance solutions for medical technology companies. And if you’ve ever wanted to know about human factors engineering in the medtech sector, then visit Medical Device Usability on stand D11. The company will have specialists on-hand to discuss any requirements visitors may have about their medical device products. A good medical device is only the sum of its parts. That’s why a variety of components manufacturers and suppliers will be on hand throughout the show to help solve medical device challenges. One such firm is global supplier of stock OEM components, Qosina, which is returning to the expo for the fourth consecutive year. “We take full advantage of engaging with them to help us understand their unique market requirements and how we can better serve their needs as they respond to ever-evolving changes in the medtech industry. “Stop by stand E8 and chat with our knowledgeable sales team about how Qosina can help you with your current or future project. You can also pick up a copy of our 2018 product catalogue, which features more than 150 new products.” Wolcott concluded. Meanwhile, family-run business Mintdale Engineering will be showcasing its automated production services for the medical device industry at stand G29. The company will be highlighting how it can produce components for a range of industries without the complex jigs and fixtures which can add to the cost and lead time. And with over 40 years of experience specialising in the design and supply of fluid components to medical and scientific markets, West Group is returning to Med-Tech Innovation Expo once again. While newcomer to the show, Maxon Motors (stand E12), is “looking forward to showcasing Maxon medical products as well as meeting existing customers and developing new relationships” according to Matt Dean, sales engineer. Supplier of pouches, lidding, rollstock, and mounting cards for the global healthcare industry, Oliver Healthcare Packaging (stand D43), says it is continuing an exciting 2018 with the show in April. Manufacturer and developer of complex serial parts in steel and high-grade alloys, Parmaco Metal Injection Mouding AG, will be displaying its products over on stand C39. Since 1992, Parmaco has developed its products for the medical, automotive and many other industries. Meanwhile Carville (stand G4) will be showcasing its range of high accuracy diffusion bonded fluidic manifolds at the expo. Used widely in medical, life sciences and industrial applications, these products can reportedly help reduce manufacturing costs, assembly time and servicing requirements by incorporating system complexity into a single component. How do you get your process to run smoothly with repeatable quality? Head over to stand F41, where Vivaldi Software will be previewing its latest quality management software. Used within a range of industries including life sciences, biotech and medical devices, Vivaldi 6 features “the latest web technologies”, according to the group. The new software can be used across any device and is intended to make work easier, save time and help users prepare for upcoming audits and manage documents and other essential information. If you’re interested in moulding simulation, FlowHow will be demonstrating the latest capabilities of its Moldex3D software at stand G41. The group explains that its software is designed to provide professional injection moulding simulation to guide customers through design process. It’s important to prepare for the manufacturing models of the future. That’s why process automation group Festo (stand E38), will be showcasing a new technology which aims to bring Industry 4.0 to medical device manufacturing. The company’s new Festo VTEM Motion Terminal reportedly turns automation tech into ‘Industry 4.0’ tech. Users can see the components working as a connected system communicating to the cloud. Additive manufacturing group Laser Proto (stand F10) is displaying its latest samples produced on metal sintering machines. Laser Proto believes that metal sintering is fast becoming the preferred manufacturing method for custom implants (created exactly for an individual) and surgical guides, allowing the design, development and manufacture of parts and devices which are beneficial to practitioners and patients alike. 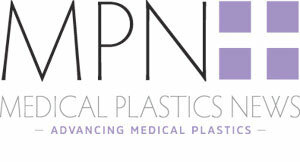 With the international market for medical plastics being estimated to reach $33 billion by 2022, it’s no surprise that Med-Tech Innovation Expo will feature a number of the sector’s leading companies. This year, Raumedic (stand C52) will be presenting a range of products made from thermoplastics and silicone. The company’s portfolio includes products made from extruded parts, to more complex solutions such as catheters and single-use cartridges for wearable patch pumps. HTE Engineering Services says it will be aiming to solve medical device joining problems at this year’s expo. As a newcomer to the show, the company will be bringing its PulseStaking process to help medical device manufacturers join their polymer components. The process is used for joining components to plastic parts and reportedly offers advantages when compared to other joining methods. The company will be demonstrating its handheld PulseStaker on stand G21 - a product for low volume production and product prototyping. Meanwhile, on stand C21, Albis Plastics is participating at the expo to showcase its distribution portfolio of plastics for use in the healthcare sector. Primasil Silicones will be celebrating 40 years in business at the 2018 expo, and plans on displaying its portfolio of silicone products. The company’s team will be available to discuss any new silicone projects customers have and technical experts will be on-hand at stand B10. Finally, plastic injection moulding manufacturer, Boddingtons will make another appearance at Med-Tech Innovation Expo. Boddingtons (stand E2) has recently expanded its production with a new plant offering expandable class 7 cleanrooms, thirty injection moulding machines and customer benefits such as disaster recovery safeguards. With the important roles medical devices play in patient care, they must be thoroughly checked so as to adhere to strict regulatory standards. This is where companies such as Industrial Vision Systems (stand E27) come in to provide inspection equipment, specifically designed for the medical device industry. Director of sales at Industrial Vision Systems, Earl Yardley spoke about what the company will have on show at Med-Tech Innovation Expo this year. In addition to this, Industrial Vision Systems will be demonstrating a robot inspection system capable of quality checking across multiple criteria. On stand F20, Zwick Roell will demonstrate its latest technology in parenteral drug-syringe testing equipment. In a Med-Tech Innovation Expo exclusive, Zwick Roell will demonstrate how drug delivery syringes are tested in accordance with stringent standards to ensure safe use. The company’s machine measures the breakaway and glide forces of a syringe - important factors as syringes are often used by patients to safely self-administer parenteral drugs. At this year’s expo, visitors to the show floor can find out about how medtech companies are helping to keep components sterile for end-use. Exhibiting at the expo are Connect 2 Cleanrooms, Monmouth Scientific, Steris AST and Guardtech Cleanrooms. All of these companies represent a market which is estimated to reach $5 billion by 2023. Steris recently released its latest financial revenue for its sterilisation technologies, reporting a 13% increase compared to last year. The increase in revenue was primarily due to the company’s core medical device customers, Steris stated. Connect 2 Cleanrooms will be exhibiting on stand F28, Steris can be found on Stand D41, Monmouth Scientific on Stand G47, and Guardtech Cleanrooms will be on Stand E43. Lastly, on stand F44, Turbex will be promoting its highly controllable cleaning equipment for washing and drying medical instruments, prosthetics and consumables. In 2017, the WannaCry attacks on the NHS proved to the UK that its healthcare industry wasn’t immune to attacks from cyber-criminals. IntelliQA is highlighting the paramount importance of data security at Med-Tech Innovation Expo, in an era where healthcare is shifting toward further digitisation. The company is presenting its software security testing tool, Micro Focus Fortify on Demand. The tool addresses application security rapidly and without the need for infrastructure investments on security staff. The tool works by assessing applications’ source codes within a short time and producing a comprehensive report detailing relevant metrics and any potential vulnerabilities. Check out IntelliQA’s latest software at stand C18. Academia is at the heart of so many medical device innovations. That’s why a team of researchers from the University of Leicester will be at Med-Tech Innovation Expo, discussing how clinicians and scientists are using near-patient and remote sensing technologies to analyse breath samples to better diagnose cardiorespiratory disease. On stand B8, members of the East Midlands Breathomics Pathology Node (EMBER) team will be discussing their work. First timers to the show, mould and press toolmakers, ND Precision Products, will be offering a chance to win a crate of champagne at their stand (A21). In addition visitors to medical tube tip specialist Polyflon’s stand (D39), can enter a short price incentive survey throughout the show.